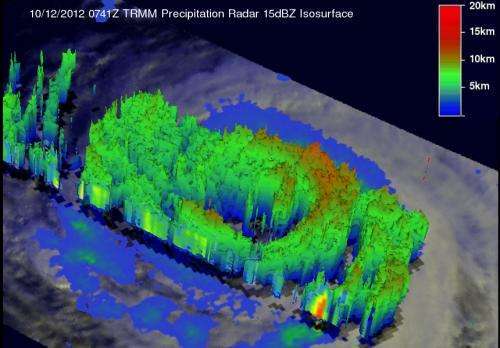 Typhoon Prapiroon has been meandering in the western North Pacific Ocean over the weekend of Oct. 13 and 14, and NASA's TRMM satellite was able to identify where the strongest rainfall was occurring in the storm. The Tropical Rainfall Measuring Mission (TRMM) satellite passed directly above weakening Typhoon Prapiroon in the western Pacific Ocean on October 12, 2012 at 0741 UTC (3:41 a.m. EDT). At that time, Typhoon Prapiroon was a powerful category two typhoon on the Saffir-Simpson scale with winds slightly less than 95 knots (~109 mph). On Oct. 15 at 1500 UTC (11 a.m. EDT) Prapiroon was still quasi-stationary. It was weaker, though, packing maximum sustained winds near 75 knots (86.3 mph/138.9 kph) and was located near 22.4 North latitude and 131.0 East longitude. That put the storm's center about 305 nautical miles (403 miles/648 km) southeast of Kadena Air Base, Okinawa, Japan. Satellite imagery on Oct. 15 showed that the cloud top temperatures around Prapiroon's eye had warmed, indicating that there was not as much power or uplift within the storm. Warming cloud top temperatures mean that the thunderstorms that make up the tropical cyclone are lower in the atmosphere than they were before, and they're weaker than before. After another day of meandering, Prapiroon is expected to start tracking to the north-northeast because a ridge (elongated area) of high pressure is building in from the east and its air flow in a clockwise direction, will push Prapiroon around it and toward the northeast. Once it starts moving, Prapiroon's center is expected to stay over open water. However, the storm's western fringes are expected to brush eastern Japan later in the week of Oct. 15.